Piso Fare Promo 2015: Still no Piso Fare Promo 2015 yet. But the new promo is already a good deal! If you plan to visit Boracay. There's an all-in P988 fare from CEBU to KALIBO! Yes, you can grab this opportunity of a cheaper fare to visit the white sand beaches of Boracay! 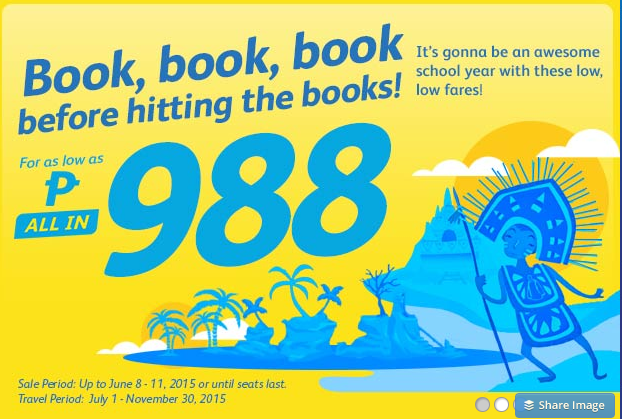 So stay tuned for more affordable flights from Cebu Pacific! Quoted fares are valid for one-way travel only. Inclusive of 7 kg hand carry baggage allowance, base fare, web admin fee and all taxes collected at point-of-sale. Terminal fees for non-Manila stations and Php 1,620 International Travel Tax must be paid at the airport. Promo fares have limited availability and are nonrefundable but rebookable subject to the following rebooking fees: Php 1,200 (domestic) and Php 2,000 (short haul) plus fare difference. For your convenience, flight changes, availing of prepaid baggage allowance for check-in baggage and self check-in services can be done up to four hours before your scheduled flight. For inquiries, call (02) 70-20-888 in Manila or (32) 230-8888 in Cebu.